It is only natural that there would be movies attempting to rise and meet our turbulent moment. Take Sam Levinson's Assassination Nation, for example. The movie is supremely unpleasant in the particularly smug way that comes from taking evident satisfaction in holding up a funhouse mirror to everything ugly and nasty in the cultural climate. In zazzy style, with frequent cross-cutting, split-screening, extreme-close-upping, and slow-motion-montage-ing, the movie engineers a small town digital apocalypse. In this worst-case scenario, the citizens of a sleepy suburb in anywhere America find their accounts hacked and secrets dumped online for all to see. It starts with the mayor, a homophobe whose affairs with men become public. Then the high school principal is the victim, smeared by contextless outrage. Soon enough, though, there are thousands of vulnerable people exposed for their neighbors to judge and loathe with virulent hate speech and even violence. Cyber bullying returns to the analog kind, becomes a contagion in the behavior of all ages. Our main character is an intentionally provocative 18-year-old senior (Odessa Young) who is gossiping with her pals (Hari Nef, Suki Waterhouse, and Abra), arguing with authority, and exploring her desires. That she becomes increasingly vulnerable as her secrets, like an ongoing sexting affair with a married man twice her age, unravel in public spaces is frightening enough. That the movie pushes and pushes and pushes, with leering close-ups and thunderous sound design, gooses the discomfort. It revels in its danger and disgust, having opened with flashes of depravity to come accompanying trigger warnings. People get lost in the murk. The large cast (including bit parts for Joel McHale, Bill Skarsgard, Anika Noni Rose, Maude Apatow, and Bella Thorne) is energetic and loose inhabiting thinly sketched arch types (the snooty girls, the bro jocks, the sniveling nerds, the prudish parents, the drooling misogynists), but can't entirely sell them as believable people. They're all pawns moved around for the movie's sharp-elbowed points. Concept is constantly privileged over character, making it heavy but sparse no matter the intensity of the subject matter and energy of the filmmaking. Here’s a town living a digital self-destruction that spills the mob mentality and casual cruelty of the internet onto the real life streets. The death of privacy is scary enough when the mobs are digital and the consequences are real life. Patterns of abuse and manipulation cross the line — people lose their minds — lives are ruined — context is lost — nuance is dead. Here it goes further. bodies pile up. Character assassination via social media turns real, with a bat swung to bludgeon a girl at cheerleading practice, and machine guns sprung in shootouts in the cul-de-sacs. There are lynch mobs in the streets and assaults on the sheets. Self-loathing becomes homicidal. And why is this town in turmoil? An anonymous creep, safe behind his keyboard, creates the upheaval for the lolz and lets the crowds' hypocrisy rear up to squash whomever is most conveniently scapegoated. Innocents are destroyed. Overreaction rules the day. The natural conclusion, the film says, is bloodshed when a comment section flamewar goes IRL. We may hate what the worst of online culture has done to our society. And yet here we stay. We can’t stop. 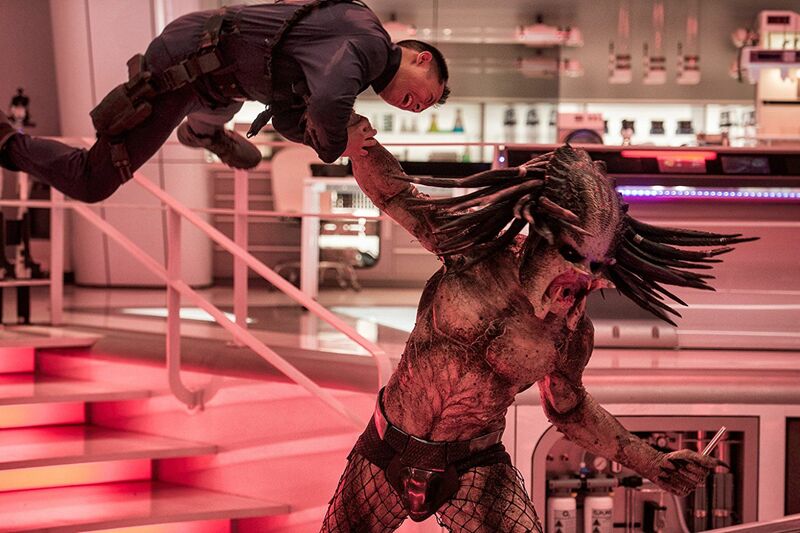 The Predator is a movie of ridiculous cornball machismo, dirty wisecracks, exuberantly gory violence, and the familiar visual trappings of a dusty sci-fi franchise in a screenplay meant only to move its stereotype characters through scenes edited to within an inch of their life for a pace cut to the bone. I suppose that’s a success. It’s the sort of movie where one guy can get speared on a branch and his buddy gets his guts blown out and then they look sagely at one another in grisly understanding as they point their weapons at each other’s heads, their eyes saying, it's been an honor fighting this alien with you, my man. I guess you end up there when your opening scene has a dead man hanging upside down and cut in half, trickling blood revealing an invisible creature beneath. It's nasty like that, but awfully breezy, too. Writer-director Shane Black has been one of our more consistent practitioners of this sort of thing, even if this one’s toward the lower rung of his films (way under his last, a hugely entertaining screwball 70's buddy detective movie The Nice Guys). Here he builds an homage to 80’s action, a tip of the hat to his Hollywood origins writing Lethal Weapon and acting in the 1987 original Predator. That movie was a fairly straightforward Schwarzenegger-fights-an-alien-hunter picture. This one’s a tough-guys-on-a-mission, secret-government-laboratory, moppet-in-danger picture, an 80's throwback in inspiration if not style. It somewhat productively crossbreeds a modern franchise sensibility with the old property's eccentricity. Boyd Holbrook is a covert ops sniper who has a close encounter with a Predator. Jacob Tremblay is his estranged middle-schooler son who is unknowingly harboring alien tech. Sterling K. Brown is the military researcher chewing over his gleefully transparent villainy who wants to shut the witness up. Olivia Munn is the civilian scientist (and one of the two (marginalized) women in the cast) who wants to get to the bottom of this, even questioning why it's called a Predator and not a Hunter. And Trevante Rhodes, Keegan-Michael Key, Thomas Jane, and assorted others are a quipping band of misfits who will become fast friends as they run through the woods and suburbs and whatnots killing or being killed by the eponymous extraterrestrial. The plot is exactly that simple, motivation and personality whittled down quite literally to easily exploited ticks and trinkets — one guy has Tourette’s, another smokes, the kid has autism, Brown chews gum — and gaps in the hurried plot are filled in only if you’ve seen a movie like this before. Yeah, yeah, Black seems to be saying, you know how a scurry-around, bad-dad, scared-son, government-conspiracy, alien-gore shoot-‘em-up goes. He doesn’t feel the need to draw the lines between all the dots for you. Blink and you’ll miss the connective tissue. It’s all about setting up enough reason to show off gun parts sliding and clicking, heavy cars accelerating, helicopter blades whirring, spaceships beeping and clanking, Predators growling and slashing, bullets rattling, character actors shouting, creature effects oozing and barking, and explosions set off like fireworks going ka-buh-buh-boom! Hey, it’s diverting enough if that’s all you want, and certainly not the worst Predator movie out there. Two of the year’s finest films come from older masters deeply engaged with spiritual matters. Both encased in an austere, boxy aspect ratio, one is a musical about Joan of Arc’s childhood, the other a depressed diary of a priest at the end of his rope. The former is an exuberant engagement with humanity’s past; the latter is a despairing howl for our future. Despite their differing approaches, they each manage to strike a tone uniquely fitted for our time. They are works of spiritual inquiry in response to overwhelmingly negative odds, asking what good can be done in the face of so much depravity and destruction run rampant. These are films about tormented souls, people who want to purify the world and yet are drawn into darkness as they contemplate what dramatic moves they may need to take to do so. The films are profoundly, respectfully, truly religious. A blessedly far way removed from the pat moralizing and perfunctory messaging of most of what passes for Christian film, here one finds artists wrestling with the big questions of life, asking probing profundities about the dizzying gap that can open up between faith as an ideal and faith as a lived experience, where actions speak louder than words, and the long, dark night of the soul leads to urgent prayerful contemplation. 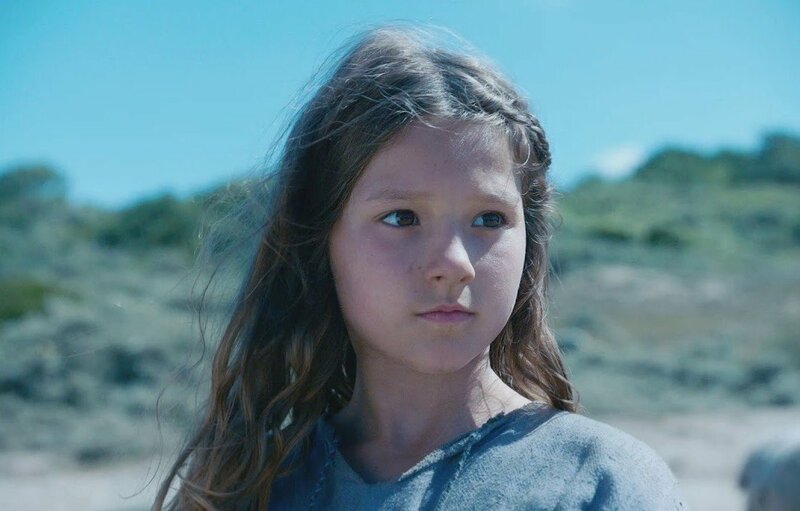 This sense of frustrated futility immovably attached to deep spiritual belief hangs over the bright and sunny vistas of Bruno Dumont's Jeannette: The Childhood of Joan of Arc. Set almost entirely outdoors in one small patch of French countryside during the Hundred Years' War -- a bit of rolling verdant hills, some sandy beach, and a thicket of woods sliced by a trickling stream, all unmarred physically by the battles -- young Joan sits and ambles around the sheep she's tasked with watching. It'll be nearly 90 minutes before we go inside. In the opening scene, 9-year-old Jeanne (in an astonishingly contemplative and interior performance by Lise Leplat Prudhomme, who manages to convey religiosity-beyond-her-years and childlike whimsy in every gesture) sings a lilting melody, declaring, about her little piece of France, “There is nothing. There is never anything.” She sees and hears tell of the injustices perpetrated against her people by the continuing English invasion, and wonders aloud why God (or her countrymen, with His divine intervention) allows it to continue. She speaks to another serious-yet-light little girl (Lucile Gauthier) who wanders through scenes; she speaks to identical twin nuns (Aline and Elsie Charles); she speaks to her rapping uncle (Nicolas Leclaire). They all operate as sounding boards for her youthful tussling with deep moral questions. Must one wage war to end war? What is one to do in the face of spiritual confusion -- a deep sense that her burgeoning visions speak to her, and yet reasonable doubt that she can cause the change she wishes to see in the world -- when the wrongs of the world are so clearly wrong, and the ways of the righteous seem not to matter in the face of them. Dumont -- whose eccentric works are of consistent interest, even when their sprawling tonalities slip (goofy cannibal screwball Slack Bay) as often as they cohere (L'il Quinquin's loopy epic small-town murder mystery) -- directs with a contained restraint, the wide open spaces and distant bleating of sheep nonetheless boxing Jeanne into her state of spiritual inquiry. The musical elements, a film sung through with gentle swirling tunes and serious lyrics deftly danced with little spasms of choreography and scored with plucking strings and heavy-head-banging guitar licks, add to the sense of youthful disgust, fragile and yet strong. Filmed en plein air and recorded with direct sound, there's a lively realism to the cracking voices and stumbling deliveries, at once impassioned and trippingly natural, the cast marvelous as they navigate the heavy internal conflict, the Hamlet-esque questioning -- to be, or not to be the saint she's meant to be -- as political and spiritual awakening, youthful disgust at the world as punkish hair-flipping, religion as deep comfort for one who rides off in the final scene, off into the sunset to become a hero and, whether she knows it or not, to meet her doom. 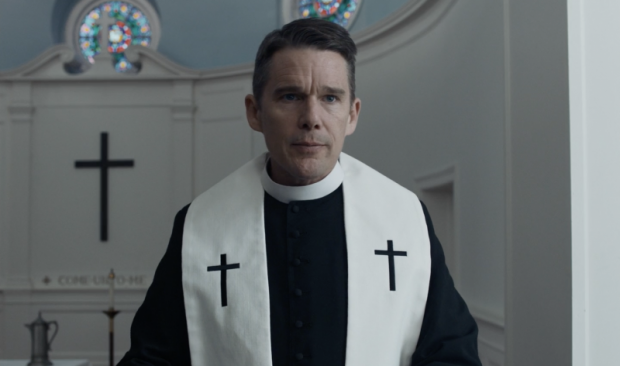 Even better is Paul Schrader's First Reformed, the best movie of the year. (If I see anything better, I'll be surprised.) It strikes a tuning fork against the mood of its main character and it resonates for the duration. It's a sustained note of unfathomable and entirely persuasive despair. Ethan Hawke, in a career best performance, plays the pastor of a small church in upstate New York. It has a tiny, largely indifferent congregation, which is just as well since the historical building is run mostly as a museum. Owned by a megachurch down the road, whose employees speak of the little 200-year-old building as a "gift shop," preparations are underway for a big anniversary celebration. Hawke's Reverend Toller is supposedly making last-minute adjustments to the grounds -- ensuring the gravestones are upright, the organ freshly repaired -- at the urging of his televangelist boss (Cedric "the Entertainer" Kyles, rumbling with cheery gravitas). But he's distracted. For one, he's having terrible digestive pains, leaving blood in the toilet, eating only bread dipped in whiskey. He refuses to see a doctor. He spends his days largely alone, keeping a diary by candlelight, feeling the despair of the world crush down upon him. He must feel it's duty to feel this pain, to internalize the world's cataclysmic problems. The movie is spare, austere, with pale digital cinematography practically crackling in the cold, shadowy rooms and wan pinkish sunset skies along the polluted river. Toller is called by a pregnant parishioner (Amanda Seyfried) whose environmental activist husband (Philip Ettinger) is in an overwhelming depression. He's studied climate change science and determined that it's cruel to bring new life into this doomed world. Toller engages him in a lively debate, pulling out all the best logical and Biblical reasons to go on living and celebrate this impending birth, but leaves having been infected by the despairing man's downward spiral. This is invigorating darkness. The rest of the film follows Toller's fervor to do something, anything, in response to the overwhelming apocalyptic feeling of modern life, a sense of a society rapidly succumbing to greed and callousness. It's not for nothing that it's set against a megachurch coopting a tiny bit of religious history -- at one point, Toller very seriously tells a school tour about the hiding places under the pews used by the Underground Railroad, clearly lamenting a modern church giving up the moral high ground when it comes to the Big Issues of the day -- in pursuit of corporate donors and a back-patting bicentennial service. Toller sees the world as polluted, and his refusal to seek help for his medical condition and mental anguish is a steady metaphor for the poison he feels rotting away at existence itself. We're doomed, he feels. And so is he. This leads to an escalating tension -- what will he do with the pain so acutely written on his countenance -- as the still frames and quiet pacing twist with an overwhelming suffusion of despair. What does one do when the problems of mortal beings feel insurmountably large, even and especially in the face of eternity? Leaning on the everlasting arms only gets you so far before you feel the need to tear the world down to build it up again. The film has deeply spiritual roots, with Schrader wearing his influences on his sleeve -- his strict Calvinist upbringing, his classic brooding screenplays (Taxi Driver, The Last Temptation of Christ, Affliction, Bringing Out the Dead), his love of transcendental cinema of Bresson and Bergman (Diary of a Country Priest and Winter Light, especially). Yet it is not just the sum of its ideas or influences. The immediacy of Hawke's performance, etched with unshakable sorrow at the state of the world and of his life and of his body, shakes with unspeakable anguish. Not even his diary, or his prayers, can contain the pain Schrader's camera captures, the soul-sick sadness that passes understanding. The film's startling climax, an inevitable escalation of the central spiritual and physical tensions of the film, comes not from merely any act, but from the breathtaking expression of utter exhaustion at society's injustices, and how it pulls back into black at the peak of its thematic exhilaration. Only in the last split second does it seem possible that it's a film that's bleak, dark, and unflinchingly outraged, and still ultimately, with the slimmest flicker of hope, about how it's better to create possibility than to destroy all. Lately, there have been some in the critical community saying Netflix is saving the romantic comedy. The reason is only because the streaming content giant has spent this year reliably dumping a cheap one on its service every week or two, movies that fit comfortably into the genre’s tropes and consistently land somewhere between a C- and a B- in execution. You have your high school versions (the oddly chintzy — and skimpily skirted — Kissing Booth, or the mostly appealing, save for a late-breaking social media subplot, To All the Boys I Loved Before), the high concept mixups (the empty calorie junk of overexerted Set it Up and the overextended Like Father), the raunchy hangout (the just-shy-of-good Ibiza), and everything in between. (This includes a sentimental wedding comedy — a little romance accompanying a sprawling family ensemble mixing casual naturalism and broad antics — in Robert Smigel’s The Week Of, my favorite of the bunch, the only one I’d almost entirely recommend without reservation, and easily the best non-Meyerowitz Stories Sandler picture in at least half a decade.) And yet, whatever the individual projects’ hits and misses, I’m sorry if I see this less as a rebirth of a genre than a slightly upscale, starrier, buzzier version of the Hallmark Channel’s chintzy factory of made-for-TV rom-coms. It's not not keeping the genre alive, but it's undeniably maintained as a marginal niche.The argument for the Netflix effect on the genre is not entirely without merit. These are movies that may not otherwise exist, for good or ill. But if you ask me — and, hey, you clicked here, so you must’ve wondered — if the rom-com is to be saved from a direct-to-streaming purgatory it’ll be through Movie Stars on the Big Screen. Luckily, we have a couple examples just in these last few weeks. First up was a movie out to prove the movies can still make Movie Stars: Crazy Rich Asians. (The filmmakers also happened to turn down a Netflix deal to prioritize a studio debut in theaters, for what that's worth.) Starring quick-witted, super charming Fresh Off the Boat sitcom star Constance Wu and hitherto unknown approachable hunk (is there any other kind in this genre?) 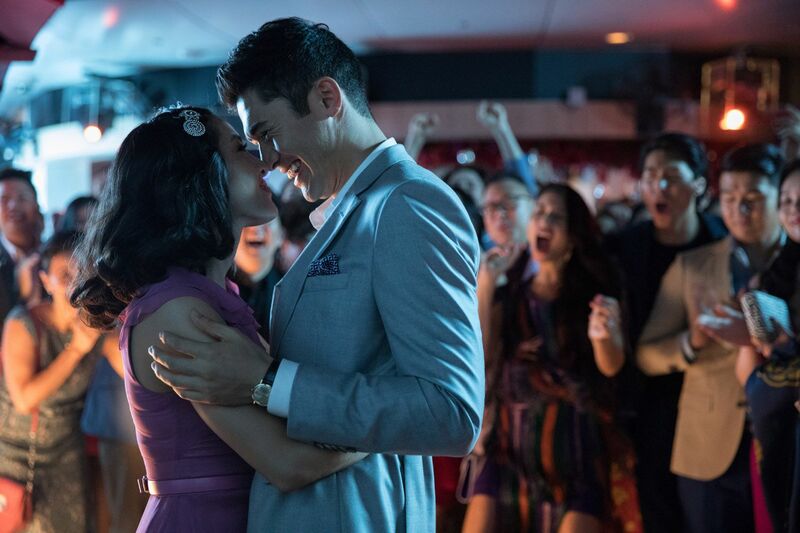 Henry Golding, it’s a dazzlingly pure-hearted comedy-inflected romance that finds its drama in a culture and class clash. She is an NYU professor. He is her boyfriend from across the pond. Their relationship is getting serious, so he proposes a trip to Singapore to meet his family. Expecting to put her Chinese-American cultural knowledge to good use, she’s startled to find that, not only does his family not think she’s “real” Chinese, but they also just happen to be among the wealthiest and well-known families in Singapore. (The biggest suspension of disbelief, presumably ported over from Kevin Kwan's novel, requires you to believe she wouldn’t have Googled him.) His mother (Michelle Yeoh, master of the tight smile and eyes roiling with contained condescension) stares her down at one point and says “you’ll never be good enough.” Ouch. 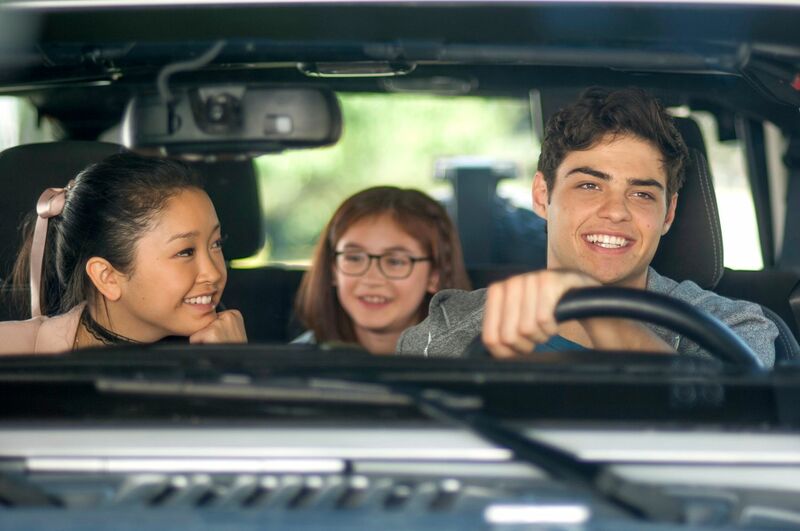 There’s a swirling ensemble of supporting characters and side-plots (some silly, some melodramatic) around the central dilemma of whether or not this romance can survive exposure to the contemporary upscale Asian experience. We see all manner of wealthy socioeconomic situations in Singapore: new money and old money gripped in an elaborate class negotiation and with feats of conspicuous consumption galore. (It’s too much, yet its fizzy muchness is the unquestioned point.) But the heart of it all is a light comic touch carried off with stylish aplomb and sleek streamlined comfortable widescreen design by director John M. Chu (of the terrific Step Up 3D and the unfairly maligned Jem and the Holograms), who drinks in the dresses and architecture, and twists the sentimental arc of the story into lovely sequences — a Material Girl fashion montage, a friend's over-the-top wedding, a tense mahjong game, a late-breaking dash to the airport — that are what you’d expect, but cut with a cultural specificity that makes it fresh, too. Then, when you get right down to it, you just hope the couple makes it through to love another day. What typical, and pleasant, movie romance feelings. It certainly put me in the mood to see more. 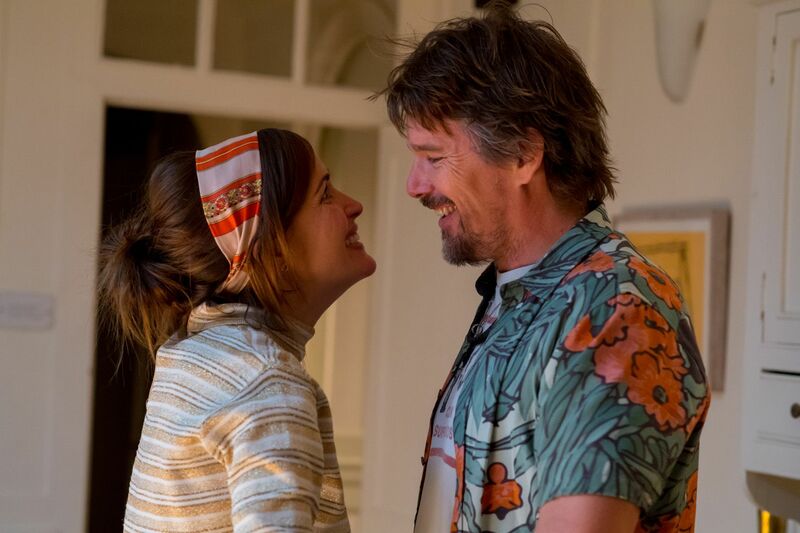 Then you can find Rose Byrne and Ethan Hawke in the Nick Hornby adaptation Juliet, Naked. Like previous films made from his sweetly prickly romantic novels, it concerns itself with music business outsiders whose interactions with the tunes of their lives leave them struggling to connect meaningfully with others. Unlike the caddish rich guy living off his dad’s one-hit-wonder royalties in About a Boy or the stunted record store fanboys in High Fidelity, this new film finds a small-town British woman (Byrne) suffering in a frayed relationship to a pompous music blogger (Chris O’Dowd). Actually, it’s worse than that. He runs a fan site for an obscure indie rocker (Hawke) whose glimmer of a chance at fame came and went with the 90’s, leaving only a generic jangly grunge album, Juliet, behind as he retreated into recluse status. Byrne plays kind exasperation well, listening to the boyfriend’s yammering about the musician with patience at the end of its long fuse. She’s had enough. She logs onto his site and leaves a scathing comment about an album of shaggy acoustic demos the record company has scrounged up and pressed with the same title as the movie itself. She calls it a sad attempt to wring extra money out of the long-dead career of a dusty cult favorite. So of course she’s surprised when her account gets an emailed private response — from the man himself telling her she’s exactly right. What follows is a lovely low-key romance-inflected epistolatory exchange, Byrne and Hawke trading voice overs as their quotidian daily lives — her work curating a tiny town museum; his chores for one of a variety of exes with whom he’s had a child — carry a new trembling charge of intimacy courtesy their pen pal secret. Eventually, in true You’ve Got Mail fashion, the question arises: should they meet in real life? Director Jesse Peretz (Our Idiot Brother), shooting an adapted screenplay by Evgenia Peretz, Jim Taylor, and Tamara Jenkins, presents this with clear, bright, pleasant simplicity. The movie, with small charms, carries the sweet tension of the central irony with a deft, light touch, and unfolds the slight, simmering romantic undercurrent with a patience for stutter-step progression of a burgeoning relationship while knowing fairly well how and when to steer away from or into genre tropes. Best, though, are Byrne and Hawke, who settle so naturally into their roles that they feel a little less like pawns in a rom-com game, and more two people with simpatico regrets whose paths cross and just might take a chance on making the other slightly happier than they were before. Isn’t that what it’s all about? There's not enough happening in the rather blandly written and directed The Nun to keep me from asking pretty basic questions punching holes in its premise. For instance, if the paranormal being needs to possess someone, why waste so much time opening and closing windows, and drifting down corridors, and turning on radios? They're the sort of questions that could only possibly be answered with the simple "because then there wouldn't be this movie." That's a satisfying enough answer when the movie is otherwise enjoyable, but this one just dithers and slithers through Catholic imagery and generic horror jumps. A spinoff of 2013's The Conjuring purporting to explain the origins of the demonic nun Vera Farmiga saw in the pretty good 2016 sequel, the movie picks up in the early 1950s. It's rural Romania where we set our scene, in a village dominated by a big scary castle that's been a convent since the Crusades. Turns out it's haunted, of course. The opening scene finds a nun hanging herself to avoid getting possessed by some hellish shadow being. Her body is found by a local delivery man (Jonas Bloquet) who falls backwards and gasps, "Oh my God!" That this is the exact moment where the screen cuts to black and blasts a gleaming white all-caps title card -- THE NUN -- proves it has some sense of humor. Later a priest (Demian Bichir) and nun-in-training (Taissa Farmiga, though her character seemingly has no relationship to the character her older sister plays in the other films) sent by the Vatican to investigate whether or not the convent remains holy ground will inform the man that they may need to find a relic with the blood of Christ. He replies: "Christ? Jesus Christ?" That's the one. Too bad, then, that the film can't sustain straight-faced wryness in the face of all its pro-forma long pauses and blasts of sounds passing for scares, and the copious free-form CG visions cut together with bone-cracking Foley. The movie knows that there's a richness to Catholic iconography in a horror setting -- bleeding crucifixes, empty ambulatory habits, giant wooden crosses, click-clacking Rosary beads -- and mixes it generously with the dark-empty-corridors, the bleeding-from-the-mouth-ghoul-boy, and the foggy-forest-with-endless-shafts-of-light-piercing-every-crooked-tree. It has a small but terrific cast excellent at looking confused and scared, then steeling themselves with an inner spiritual light. But the images and characters are undone by a plot that's a tangle of nightmare logic, slippery and overcomplicated, at once deeply stupid and impenetrably dense. It bored me, and occasionally provided some visual interest, but I was entirely uninvolved in the goings-on and completely fear free as I regarded the predictable motions every scene makes. That gave me plenty of time to spend asking questions like, why have the nuns stayed tormented in the convent all these years if the ultimate solution was so simple? And, if the Church knew about the dark evil growing there, why allow it to fester for so long unaddressed? (Oh, wait. Maybe that one actually makes sense.) The whole thing just feels so much of a missed opportunity, a good premise and fine setting and capable cast left to tread water in overfamiliar plot mechanics. There's a good movie clawing to escape the mediocre one around it. This summer movie season ends with two small thrillers about families torn apart. One, Searching, apes the great Unfriended's all-on-a-screen style, at the behest of that film's producer Timur Bekmambetov, to middling effect. It tries hard, but is less committed to the bit. First-time feature writer-director Aneesh Chaganty, heretofore helming some Google commercials, doesn't have a scenario that lends itself to the technology. It's an agonizingly conventional missing-person thriller with a few weak twists and a slowly developed simple expression of exposition. 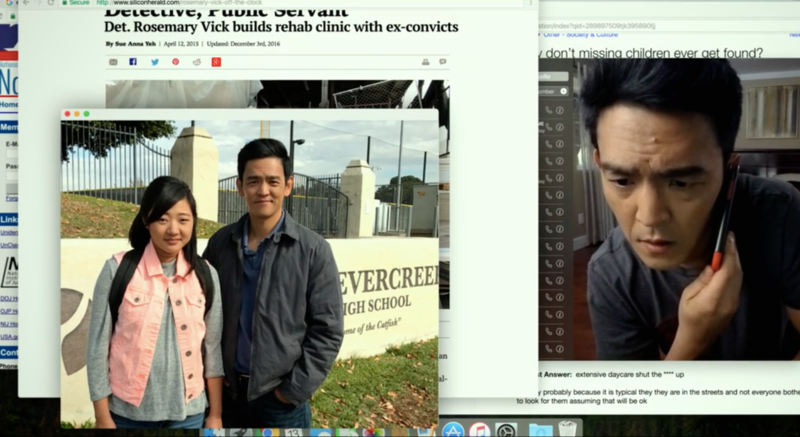 High school sophomore Margot (Michelle La) isn't answering her father (John Cho) despite numerous texts and calls when she first doesn't return home from a study group and later doesn't show up at school for her exams. What's a guy to do, but dig into her digital past while a bland detective (Debra Messing) calls and emails him updates? Rather than creating a movie in which the technology of cams and clicks is integral to the plot, I kept wondering why scenes were composed and contorted to excuse keeping its characters in that frame. This makes it more conventional than Unfriended, and more unsatisfying, as it's pushy, leading the audience by the nose, zooming and panning, cutting between devices, contriving reasons to keep characters connected no matter how improbable. The cast of characters are people who FaceTime more than probably anyone in the world. Why would the daughter's Facebook friends take FaceTime calls from her dad? Why would a police detective working a missing person case answer a video call from the worried parent in the middle of the night? We see her pulling a coat on and waving her pajama-clad son away as she races out the door. Is this scene materially helped by the style? No. But the friction just barely makes a bad scene passable nonetheless. Here we have style just barely, fleetingly propping up a story that’d be completely preposterous if told conventionally. A story of how alienating digital detritus can be, how deceptive, misleading, incomplete a picture it creates, is a glimmer of a good idea, but it's so underwritten and thinly drawn that only its glancing mood connection to those Year-in-Search Google ads' stupidly effective sentimentality keeps its card scam shuffle of a story afloat. (The Big Twist's game is up super early if you notice the girl's high school’s mascot and later apply Ebert's Law of Economy of Characters.) Puncture that, and all you have is the terrific Cho — rage and fear wrestling in most despairing glowers — doing heroic work nearly single-handedly saving a movie so misconceived. A better debut feature about broken family (and interactions with technology, sort of) is Jonathan and Josh Barker's Kin, a little movie that's slippery about genre, but admirably sturdy about character. 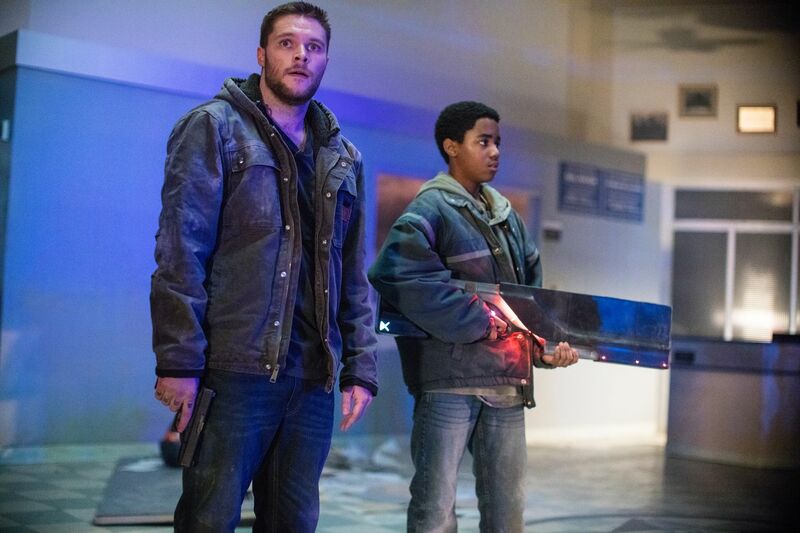 It starts as a slice-of-Detroit-life, with a troubled middle schooler (Miles Truitt) suspended on the eve of his adopted father (Dennis Quaid) welcoming troubled older son (Jack Reynor) home from prison. That the boy happened to find a futuristic ray gun in an abandoned warehouse he was scouting for scrap metal is the least of his problems. Soon, though, it is apparent his brother may be out of lockup, but he's still trapped in old bad decisions. Trying to get out from under debt to a menacing low-level gangster (James Franco), a scam goes sideways, and the two brothers end up on the run, as a frosty Michigan crime story becomes a languid road movie prickly with the tension of wondering when the older brother's past will literally catch up to them and if the younger brother will learn the truth of their situation. And there's still the laser cannon — Chekhov's ray gun? There's a double reference to all you English major Trekkers out there — hiding in the kid's duffle bag. Unbeknownst to our hero, two future (or interdimensional or extraterrestrial or something) soldiers have stepped out of a portal and are looking for it. All this and a stripper-with-a-heart-of-gold (Zoe Kravitz, warmly humanizing a stock role)? There's a lot going on in Daniel Casey's script that's somehow on a clean, simple, derivative arc and still sometimes slipping away from expectations. Partly, for all the genre frippery powering the plot engine and crowding the margins of scenes that build to suitably tense thriller sequences, it keeps the focus tightly on its brotherly leads and their unsteady relationship. Especially vivid and sympathetically drawn is the interior life of its young star. His insecurities are plainly written on his face, his struggle to live up to his father's supremely moral example etched in every decision, the seduction of a powerful weapon as a way for an isolated boy to wrest false control over a chaotic life sharply displayed, and the ultimate catharsis of deus ex machina self-discovery some kind of cockeyed moving. Even if I didn't entirely believe the mechanics that bring about the conclusion — if you see it, know I asked myself in the moment if any of Franco's gangs actions in the film's second half ring true — the journey was still basically satisfying, textured with enough beautifully photographed character detail to keep me involved.